Does anyone know anything about Joseph Higham and his relation with concertinas? Not long ago I acquired this beautiful Lachenal English concertina from Barleycorn Concertinas. What draws my attention is the fact that it has a “Joseph Higham” label on. 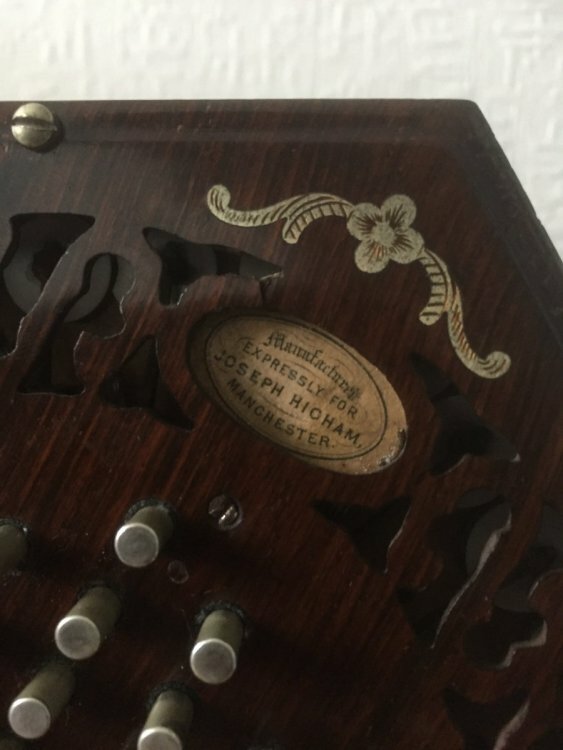 I’ve been trying find some information about Joseph Higham manufacturers and I can’t really find much that relates him with concertinas, other than he had a music shop/factory in Manchester? Is not uncommon to see Lachenal concertinas badged under a different name or manufacturer. 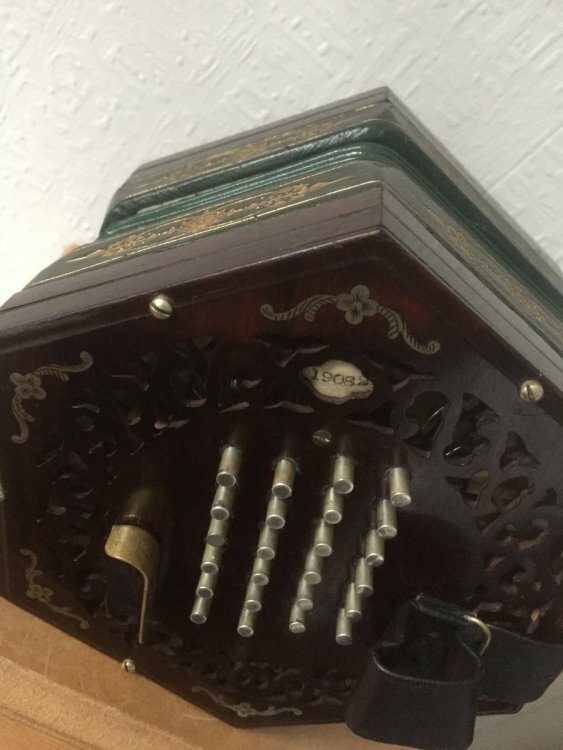 Nevertheless this concertina plays beautifully and even looks like the inimitable, just with brass reeds. The serial number is 19082. You have probably answered your own question/s ? 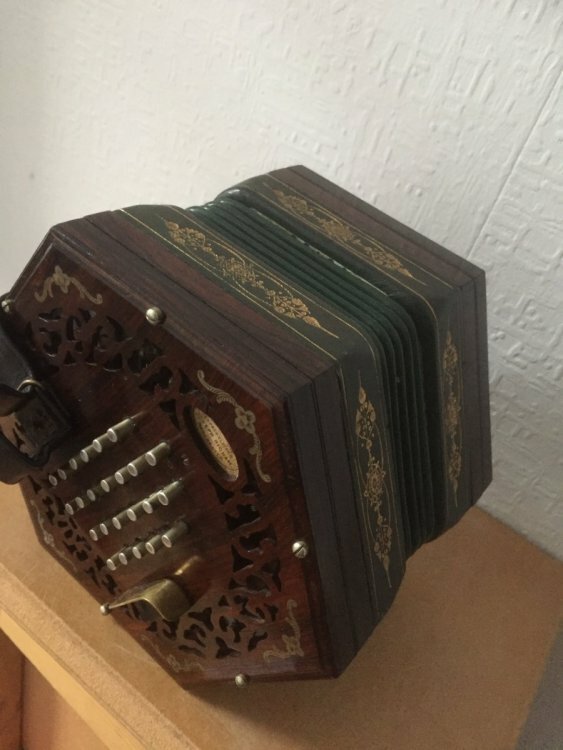 Higham had a shop in Manchester, he sold Lachenal concertina's bearing his shops label, as it seems did just about every other 'Dealer/Shop' throughout the country at the time ? there may be nothing else to discern ? That’s the only bit of information that I found about him, I thought he was a maker or restorer. I’ve had a Lachenals in the past labelled Wheatstone and Crabb, who obviously were makers, so I thought Higham could have been a maker. I find it interesting that Lachenal concertinas had different labels; wouldn’t that be sort of “ilegal” nowadays? I think, that bearing a label which reads "Manufactured expressly FOR Joseph Higham, Manchester", there is no deceit, actual or implied by the vendor, back in the day. It is far more opaque than many Lachenals that bear labels implying that they belonged to a 'Maker' as opposed to simply a vendor/retailer. It seems to have been was a common practice with ( at least ) many stringed instruments too, but very much so with concertina's. You have probably found this ref. to his Brass instrument factory and sales. I wouldn't take it as read that he manufactured Harmoniums, despite the last reference. Or a No.6 ? if fitted with brass reeds, as stated ? Fully ornamented, but not tempered steel reeded ? for quieter playing but with the looks ? I had overlooked both the OP‘s stating of the Inimitable and the instrument having brass reeds. However, I stumbled over the rather flat keys myself - I would have expected an Inimitable to have „spherical“ buttons just like my Excelsior. Did you actually see the brass material? Yes that’s website that I looked but still couldn’t find any mention or pictures of a concertina. Not sure if it’s an actual inimitable or not, but yes it has brass reeds and a lovely sound. I forgot to ask Chris Algar about the history of this concertina. Nothing to do with concertinas, although I do have 2 Jeffries. I bought this drum, which was in a very sorry state, in an 'antique' shop in Sheffield 40-odd years ago. I hesitated until, examining it more closely, I found 'J. Higham, Manchester' stamped on the brass barrel. So then I had to buy it. I dont know if J. Higham was any relation. Well apparently Joseph Higham had a music shop/factory in Manchester. Not sure if he was a manufacturer. Not of concertinas, but of all sorts of brass instruments.